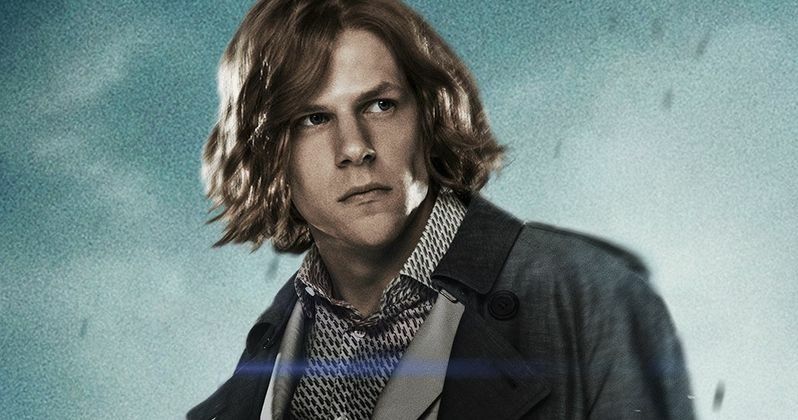 It looks as if Jessie Eisenberg's portrayal of Lex Luthor may have been cut out of the upcoming Justice League movie entirely. The news comes after it was rumored that Darkseid had been cut out as well to focus on Steppenwolf being the main villain and possibly making Justice League a standalone movie as opposed to setting up Darkseid for a second movie. Eisenberg played Luthor in last year's Batman v Superman: Dawn of Justice to mostly mixed reviews, but he created Doomsday, the one to kill Superman, and set up the rivalry, so some were looking forward to seeing what Lex Luthor had in store for Justice League. Jessie Eisenberg's inclusion in Justice League was announced via press release late last year, but apparently all of his scenes have been cut under the direction of Joss Whedon. BatmanOnFilm has revealed that Eisenberg is no longer in the movie. During a Q&A, a fan asked about Lex Luthor's role in Justice League. BoF had this to say. "He doesn't have one. If he did prior to all the changes/reshoots, it was cut." Luthor was sent to Arkham Asylum after the events of Batman v Superman and many assumed that he would be a part of the movie in some capacity, especially when it was officially announced that Eisenberg would be reprising the role back in December. If the report is to be believed, Whedon is doing quite a bit of work to craft a movie out of what he was left with. There have been reports that Zack Snyder's original rough cut was unwatchable, that is backed up by BoF. That report coupled with reports on directing credits have led many to believe that Joss Whedon is doing a complete overhaul on the movie and now it seems to be confirmed if Eisenberg was truly completely taken out of Justice League. BoF also reports that the rumors of Darkseid being removed from the end of the movie are also true, much to the disappointment of fans who were looking forward to seeing the villain pop up and possibly be the main villain in the next Justice League movie. All of these rumors go on to suggest that Justice League will be one and done if it doesn't do what it needs to do at the box office. Whedon could be just preparing the movie to be a standalone as a cushion for if things turn out badly, but at what cost? All of these reports have not been officially announced by anyone, so it is best to take the news with a grain of salt. However, where there is smoke, there is often fire and Justice League appears to be a 5-alarm fire by all the smoke that has been billowing from the production. Hopefully the movie comes out to be a huge critical and fan favorite when it makes its debut in November and makes all of the turbulence worthwhile. Justice League opens on November 17th, 2017.